Narrative Description: The put-in is located behind the Hermits Cove Marina. It is concrete and the drop-off is steep so use caution. You will need to cross the St. Johns River twice so use caution and check the weather before launch. Motorized boat traffic is likely but sparse. There are no take-outs. Restrooms are located in the pub. Creeks weave around the islands and lily pads and Vallisnaria abound. Trout Creek is a long crooked creek that averages less that 50 yards wide leading from Hermits Cove toward the south around Trout Island. Trout Creek is sheltered and has little current. The creek is 1.5 miles long. The St. Johns River is 300 yards wide and splits the islands. 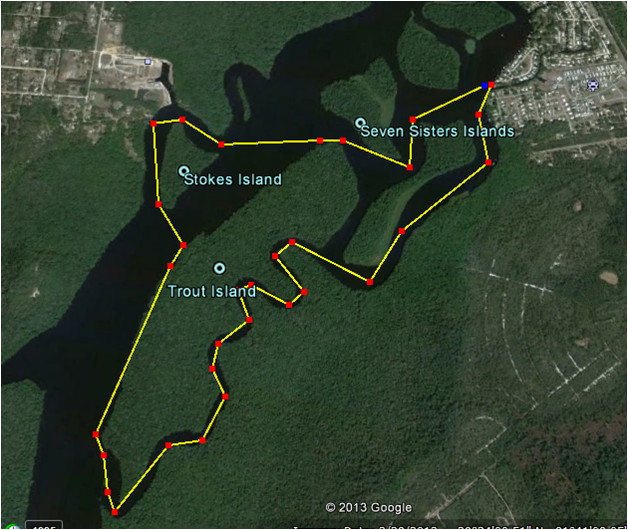 The Seven Sisters Paddling trail is located at eastern end of the Marjorie Harris Carr Cross Florida Greenway, 0.5 mile south of the Buffalo Bluff railroad trestle and 12 miles south of the Palatka bridge. This historic area includes Stokes Landing to the west where John Bartram stored supplies, shipped his samples and received his mail. The Union and Confederate armies fought the Battle of Horse Landing and the Union ship Columbine was sunk here. The trail includes nine uninhabited islands and the entrance to the Cross Florida Barge Canal. Except for the communities the shoreline is largely a flood plain swamp and hydric hammock. Creeks weave around the islands and lily pads and Vallisnaria grass abound. There is a long crooked creek that averages less that 50 yards wide leading from Hermits Cove toward the south around Trout Island. This trail is 1.5 miles long. The St. Johns River is 300 yards wide and splits the islands. The Rodeheaver Boys Ranch is 1 mile south of the islands. There are sunken barges and ships in the river across from the ranch creating interesting viewing.